John Penton opens his front door with a slight look of confusion on his face; he knows about the scheduled visit, but he’s still clearly puzzled why a young man from Baltimore would drive 400 miles to Amherst, Ohio, to chat. Now 90, Penton’s peak height of 5 feet, 5 inches has been rounded off with age; the athletic build he once had as one of the greatest motorcycle racers of his era is gone, now immortalized in the engravings of the plaques and trophies that bear his name and in the book and movie about his life, both created by other men who admired him. Penton has never asked for any of this attention, and it still makes him chuckle that people continue to find his life interesting. “The little incidences that naturally happened along the way, so many of them are gone,” Penton says after several moments of pause. But then he immediately jumps to the end of the 1959 ride, to a moment on Route 66 west of Needles, California. “I never saw [Earl] Flanders. 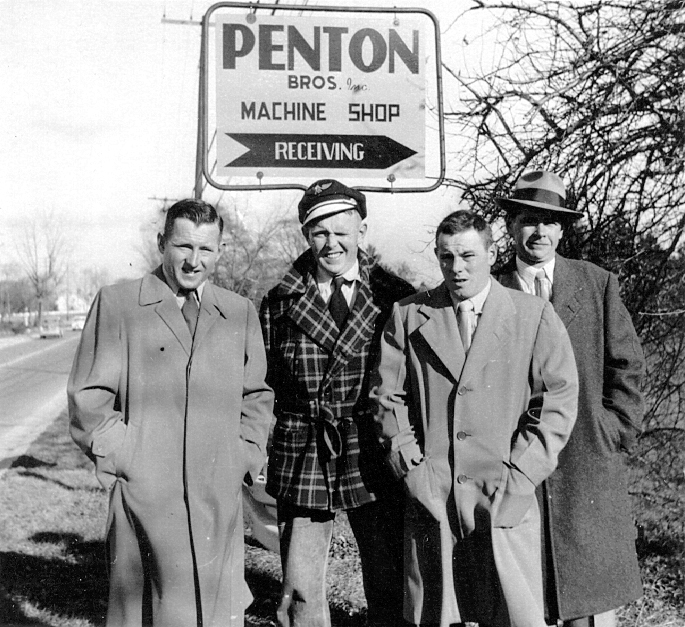 In fact, I never knew he was following me until he did catch me up.” Very few people knew Penton was attempting the record—only his brothers and Al Bondy, the U.S. BMW distributor with whom he’d stayed the night in New York before his departure. 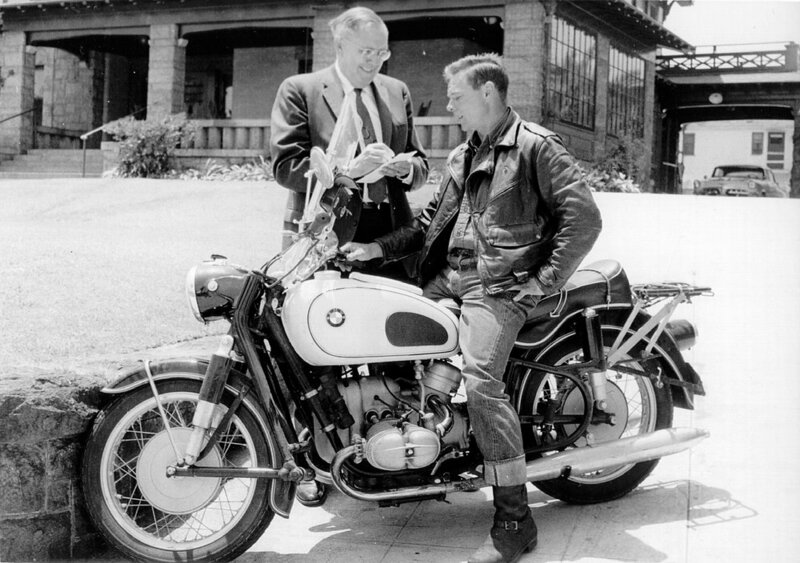 Flanders, the Western BMW distributor, got a call from Bondy and waited for Penton in the Mojave Desert west of Needles to help guide him through Los Angeles to the Western Union office, where his time was recorded. A photographer took photos, the news went out on the AP and UP wires, and soon the entire world knew the name John Penton. The first person to cross the United States on a motorized vehicle was George Wyman, in 1903. Riding a California Moto Bicycle, he spent 50 days traveling from San Francisco to New York. The Bicycling World and Motorcycle Review reported on his progress and Motorcycle magazine contracted him to write five articles about his journey. The most famous name associated with transcontinental rides, and to whom the term “Cannonball Run” pays homage, is Erwin Baker, who set dozens of long-distance records, including a motorcycle ride across the country—San Diego to New York—in 11 days, 12 hours, and 10 minutes, in 1914. 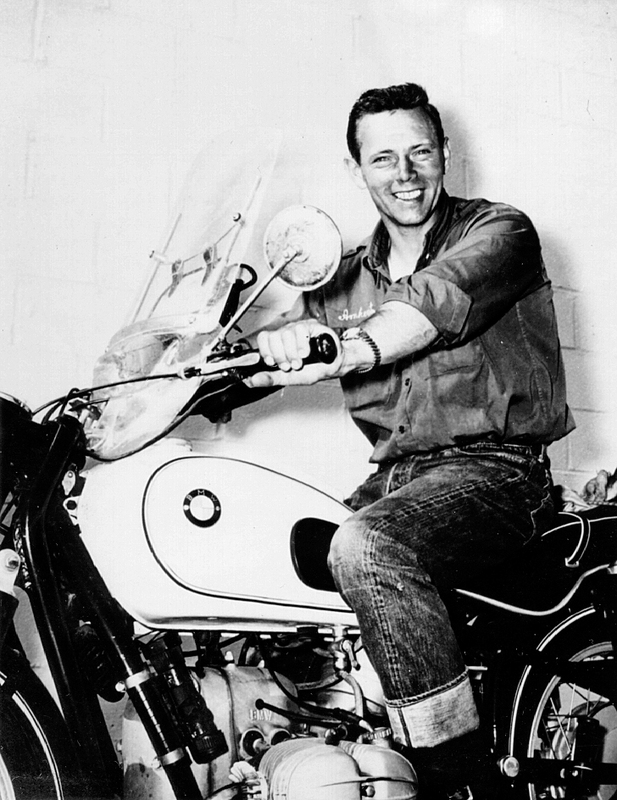 Like Wyman, he wrote about his own journey in a 10-page, detail-rich article for Motorcycle Illustrated; in the desert, he put a pebble beneath his tongue to keep him from wanting to exhaust his water supply. He ran out of gas in Arizona and carried a .38 caliber gun, which he used to kill the animals that attacked him. Penton’s riding horizon was already built up through all the miles he spent in the saddle traveling to the major enduro races, competing on the same bike—a German-built NSU—and then riding it home. He also realized his knack for LDR in the weeks he spent riding and mourning the loss of his young wife. By the time he rolled away from the New York City Western Union office on Broadway and into the Lincoln Tunnel at 5:59 a.m. on the morning of June 8, 1959, Penton was more than ready to cross the country in one sleepless dash. Although he admits today that he had no set time or goal, interviews given to Cycle magazine indicate that he was shooting for 54 hours. Riding a 600cc, 35-horsepower BMW R69 with two small modifications—a 6-gallon fuel tank and a fender rack—the 33-year-old rode across the newly built turnpikes of the Eastern United States. He remembers waving to his brothers, who were on the side of the Ohio Turnpike near Amherst, and vividly recalls the moment he saw the flashing lights coming into St. Louis. Word was passed from New York and a motorcycle dealer in St. Louis arranged for a group, which included two police officers, to help guide him through the city. They handed him two ham sandwiches and two cups of milk without stopping. In Oklahoma he encountered 200 miles of driving rain and strong winds, and 110-degree heat in Amarillo, Texas, but overall he remembers the weather being exceptional. The only blemish of the run was a rest stop near Flagstaff, Arizona, about 500 miles from L.A. The road was blacktop and Penton was seeing double in the night. “Those lines were getting closer and closer together and I was getting into trouble,” he says. He stopped, set two alarm clocks, and shut his eyes for 45 minutes. At 8:10 a.m. on June 10, still wearing his rain pants from the Oklahoma showers, Penton stopped in front of the Western Union office in downtown L.A. to record his official time: 3,051 miles in 52 hours, 11 minutes, and 1 second, traveling at an average speed of 58 miles per hour. 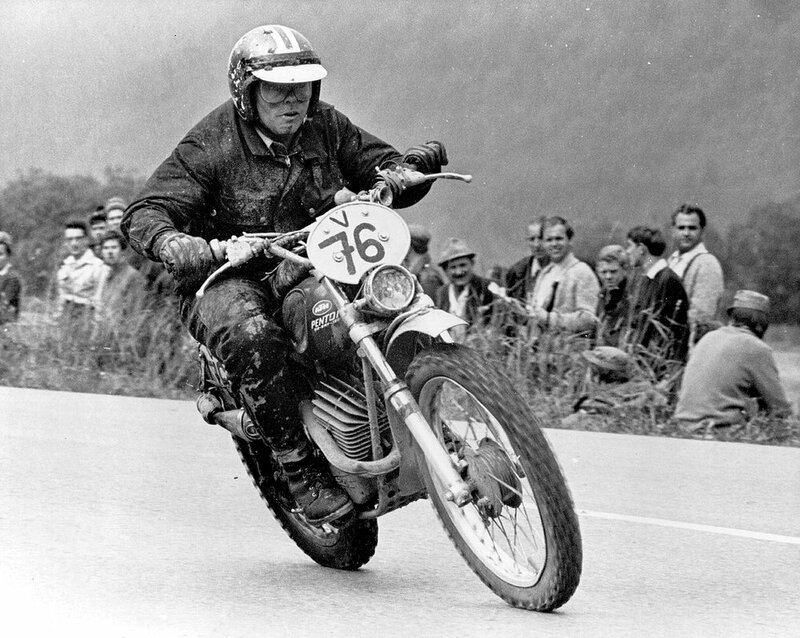 Motorcyclist magazine reported that very little fanfare greeted Penton. He handed his tattered and stamp-filled letter to Miss Jeanon Smith, a Western Union employee, and posed for the camera of George O’Day of the Los Angeles Herald-Press. He gave reporters a few quips, “Some people like to climb mountains” and “Just for kicks,” when asked why he rode across the country so quickly. After 12 hours of sleep, he met with Floyd Clymer, publisher of Cycle and a future fellow AMA Motorcycle Hall of Fame member, attended flat-track races at Ascot Speedway, and was introduced by announcer Roxy Rockwood. There he met Rodger Ward, who had recently won his first of two Indianapolis 500 races. “That must have been a lot tougher ride than my 500 miles,” Ward told Penton. After visiting friends in Riverside, Penton rode home and moved on to the next challenge, which was to try to earn a gold medal at the International Six Days Enduro, the one racing goal he regrettably never achieved. 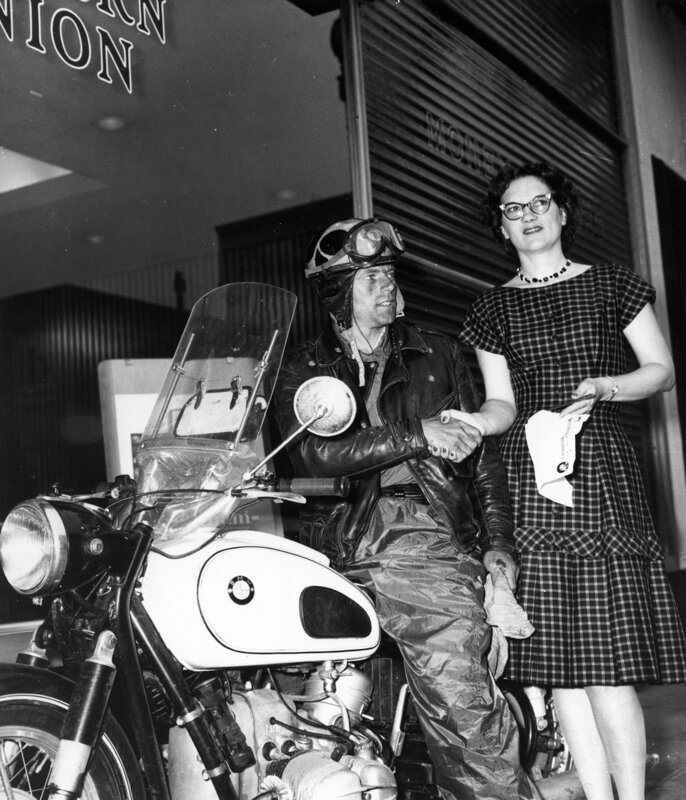 Nine years later, a 22-year-old Hungarian named Tibor Sarossy bought a BMW from Penton’s dealership and rode from New York to L.A. in 45 hours, 41 minutes. With more interstate options, Sarossy’s ride was 2,687 miles, nearly 400 miles less than Penton’s. The details of his ride were documented in a Cycle World feature in December 1968. By that point, Penton was importing motorcycles with his own last name emblazoned on the gas tank. 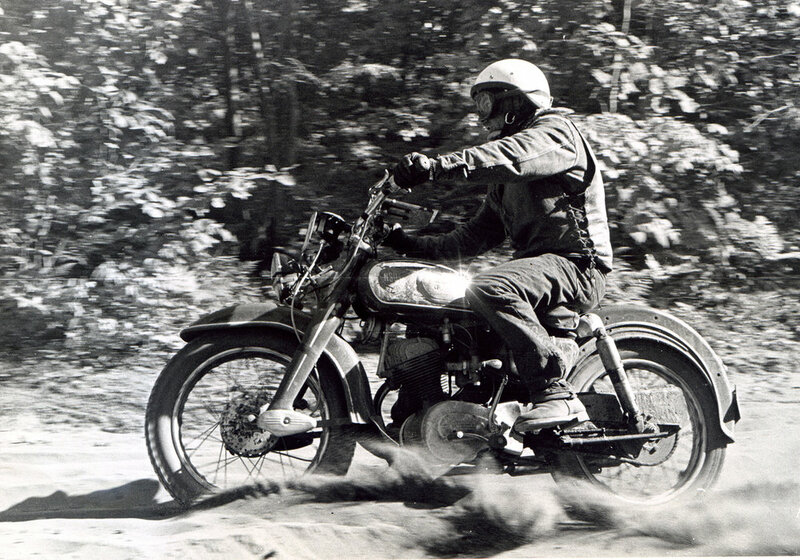 I came to Amherst to talk about a single motorcycle ride, but the conversation often veered into World War II, where Penton crossed the Atlantic three times with the Merchant Marines and risked the wrath of German U-boats; he watched ships go down, rescued former schoolmate Mack Mackenzie from the Mediterranean Sea, and sailed to Okinawa and Korea in the Navy, where he waited for the defeated Japanese to leave Seoul. We got into a discussion about what he believes to be the most revolutionary product in off-road motorcycling history: the O-ring chain. Never mind the fact that it was Penton who introduced the small-displacement off-road motorcycle to the U.S. in the form of a 125cc, 15.5-horsepower, 185-pound two-stroke called the Penton. No, he’s more fascinated by how riders like Kailub Russell and Taylor Robert can race for a week in the ISDE and not swap a chain. “They don’t even have to think about it!” he exclaims. The chain conversation then causes him to bring up a product he feels stupid about not having invented himself: hand guards. “Look at these hands!” he says, holding up his wrinkly and bumpy 90-year-old paws. The knobby knuckles and deep purple lines tell stories of the many trees that were unfortunate enough to be in the path of one of his motorcycles. And then, after three hours of discussion that weaved in and out of the transcontinental ride, it’s obvious that the minor details have simply been lost to time. Penton has done so much that the record run to L.A. can be seen as a footnote, and it’s almost as if he’s being asked to recount the details of a long-passed routine trip to the grocery store. He leans forward to examine a piece of paper on the table. “I have a tax problem that I have to take care of today,” he says. And that’s it. The next challenge, while minor, waits at the Lorain County Courthouse, and John Penton rushes off to face it.